The Evangelical Lutheran Church of Canada conducted a survey in St. Albert for a possible location of a Home Mission Congregation in 1964. Property was purchased at 11 Glenview Crescent. In February 1966 Reverend R. Olson accepted the call as Home Mission Developer for St. Albert. In March of that same year the first meeting for organizing the working committees met. That month Ruth Jansen, Parish Worker for the Home Mission board was placed in St. Albert. The first service of the congregation was Easter Sunday, April 10, 1966. The service was held in the auditorium at Sir Alexander MacKenzie School. The following week the first Sunday School classes began. The sod turning ceremony was held at the current sight of the church building on April 24, 1966. Dornwood Construction was awarded the contract to the build the church in May 1966. Looking like a ski chalet in the middle of the town, the first service in this building was held September 25, 1966. Organization of St. Albert Evangelical Lutheran Church, the installation of Pastor Ray Olson and the laying of the Corner Stone all took place in October 1966. The dedication of the new church building was November 20, 1966 with Dr. S.T. Jacobson officiating. The narthex was added in 1981. This addition is where the church offices are now. January 1997 began the planning of building an addition to the existing church. Letters were sent out informing the congregation of the new building plans and building pledge forms were sent out. The sod turning ceremony was held April 26,1998. The building contract was awarded to Dawson Wallace Construction Ltd. May 1998. The first service was held August 16, 1998 and the dedication of the new addition was celebrated October 11, 1998 with Bishop Stephen Kristenson officiating. The basement under the new addition was finished ahead of schedule as many volunteers worked hard to complete it. The kitchen was designed by the ladies of the congregation. Many who use it compliment us on our beautiful kitchen. The talents of many are displayed in the church. Paraments, vestments and wall hangings for the different church seasons have been designed and sewn by a congregational member. The wood furnishings such as the altar, lectern, baptismal font and pulpit were also designed and built by another parishioner. As well, the many paintings throughout the building were painted by some of our talented members. The rugged cross above the altar was made from a tree that was planted when the original church building was built. It grew in the approximate area of the current location of the altar. 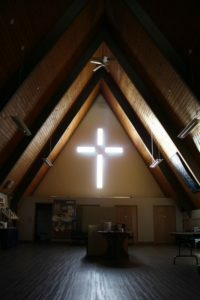 During the construction of the addition in 1998, some of the men of the congregation cut the tree down, preserved the wood and made the cross. Pastor Ray Olson resigned in 1975 and one year later Pastor Ray Christenson became the Pastor. Pastor Bill Flath took over from Pastor Ray Christenson in March 1985. Pastor Flath was here until his retirement in July 2000. Pastor Lynne Hutchison began her ministry with us October 1993 and was with us until accepting a call to Winnipeg in 1998. Following the retirement of Pastor Flath, interim Pastor Marv Krebs served us until 2002. September 2002 Pastor Phillip Gagnon accepted our call to ministry and still serves us today. Our Lay Pastoral Assistant Gary Braeuer was installed in 2008 and has served with our board of deacons and council. Many volunteers and paid staff have ministered to our youth. The hired Youth Ministers were Dan Gilliland, Donovan Mutschler, Pastor Lynne Hutchison, Anne Zimmerman, Tim Dolsky, Amanda Hansen and Heather Hanson. In 2012 the congregation made the difficult decision to sever our relationship with the ELCIC and subsequently made the decision to join the North American Lutheran Church.